Today is my stop on the blog tour for The Suicide Plan by Emma Clapperton and I get to share my review with you all! Standing up and welcoming everyone to the spiritualist church is something Patrick McLaughlin does most evenings. Most of the faces in the audience are familiar to him, except one. David Hopkirk walks into the West End Spiritualist church in Glasgow and slits his own throat in the middle of a demonstration. Buy why? Emma Clapperton, born December 1985, has always had a passion for reading and writing. She particularly enjoys reading supernatural or horror books. Emma studied childcare and gained qualifications to work with the early years in 2002, later going on to work in the Montessori sector of early years. In 2017 she gained a qualification to work as a Forest School early years leader and can often be found teaching three and four year olds how to cook on an open fire. She is the writer of a supernatural crime series based in Glasgow, which she writes under the pen name of Emma L Clapperton. She currently resides in a little town outside of the city of Glasgow with her husband and ginger cat and is working on future projects. The Suicide Plan is a short novella that focuses on Patrick McLaughlin, who is part of the West End Spiritualist Church in Glasgow. On this particular evening, a man called David Hopkirk comes into the church and commits suicide in front of the congregation. This traumatic incident begs the question, why there? Why in Patrick’s church? What follows is an unusual story, with elements of the paranormal as well as a murder case that is time-sensitive. I don’t know what I was expecting when I started The Suicide Plan, but it was a punchy and different storyline to my usual reads. With such a short story it’s very difficult to write a review without spoiling anything. Emma has managed to pack a hell of a lot into so few pages, with an intriguing story and some very well-drawn characters. Really enjoyed this one! Cadence Hart has just six months on the job left. But six months might as well be a lifetime in the dangerous field of Deportations. Armed with a flaming sword and backed by Alf, her Demon partner, she’s the thin blue line between the Souls escaped from Hell and the living residents of the city. Missing persons cases aren’t her usual line of work, but a young woman has disappeared in strange circumstances and Cadence is pulled off her regular duties to investigate. The girl’s parents think she’s possessed. Which is impossible. Only, from what evidence there is – it looks an awful lot like she’s possessed. To solve the case, she’ll need the help of Matthew, a Soul expert. Matthew gained his expertise first hand – he’s been dead since before Cadence was born. But when their investigation unearths links to the devil-worshipping cult, New Dusk, they begin to realise that the case might be more than even they can handle. 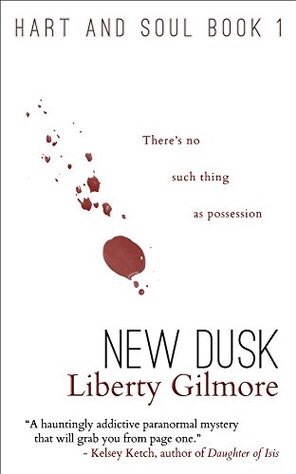 In the interest of full disclosure I’m going to be honest and say that books that have the paranormal theme are not usually something I would pick up, so when I agreed to read and review New Dusk I was a little apprehensive. What if I didn’t like it? What will I say to the author? Well I needn’t have worried, New Dusk was a great little book!!! We meet Cadence Hart (a Deporter) smack bang in the middle of a fight with a Shade, a soul escaped from Hell. Helping her, is her Demon partner, Alf. I think the fact that the book opens with a scene like this grabs the reader immediately! I know I was suitable intrigued from the outset. Cadence gets called to investigate a missing persons case involving a young woman who was caught on camera acting very strangely before she disappeared. This is not her usual type of work, but there’s evidence to suggest possession and Demon involvement so she gets the case. Helping her, is Matthew, a Soul expert. He himself is a Sin (did something bad but not intentionally) so he will be of use during the course of the investigation. Matthew and Cadence worked really well together as characters, I really liked them both. New Dusk was exactly what I needed to read at the right time. I’ve been incessantly reading psychological thrillers so this break from routine was perfectly timed, and New Dusk was an excellent read. 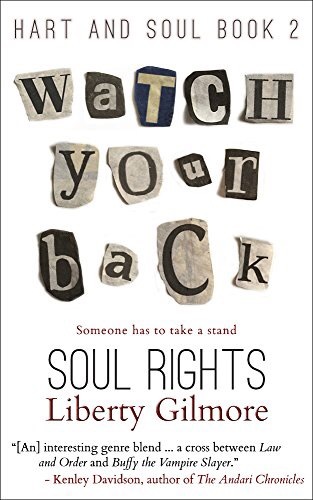 Well written, with a very interesting plot (which I won’t divulge as I can’t do so without probably spoiling something 😂) Liberty Gilmore has the beginnings of a brilliant series in the Hart & Soul books. I would happily read these one after another, not least because New Dusk’s ending is left quite open!